Use these thick, large, moist wipes with the heavenly essence of Mango as a touch-up between baths, as a grooming solution, or as a bath alternative. 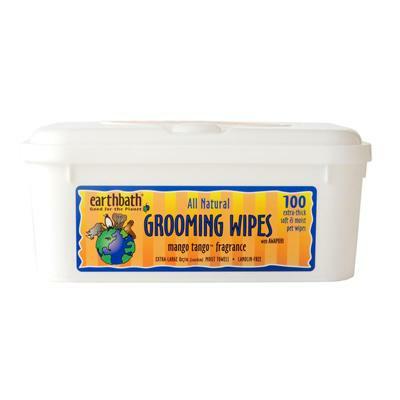 Earthbath grooming wipes safely and easily cleans pets' dirty paws, undercoat, and dirty bottoms too! Imparts a show quality shine. Removes dander, drool, and discharge. These wipes contain only natural, mild cleansers and conditioners, including exotic Hawaiian awapuhi extract, a shine-enhancing coat conditioner. These natural wipes contain no animal by-products (lanolin-free) or alcohol and will not remove spot-on flea control products. All varieties contain Aloe Vera and Vitamin E to moisturize coat and skin. Notice how soft your hands are after wiping your pet... Safe for daily use on all animals over 6 weeks old.